I’ve just returned from two very special weeks in South Africa. I was part of a group traveling with Julie Zickefoose, looking for birds, animals, and plants. We began in Cape Town, traveled down the peninsula to Kirstenbosch National Botanical Garden, drove along the coast, visited De Hoop Nature Reserve, went over to the West Coast National Park, then flew to the eastern part of the country. In the east we visited Blyde River Canyon Nature Reserve, Kruger National Park, and Sabi-Sands Private Game Reserve. You will be hearing of several of these places, with an emphasis on the birds we saw, as I work my way through processing the thousands of images I brought home. I thought I’d start you off with something not native to South Africa. On our second day in the Cape Town area we visited the Strandfontein Wetlands. Actually, it’s a sewage treatment area, but most attractive to birds and with little olfactory reminder of its intended function. We happened to hit a special day there, and chanced upon Cercotrichas galactotes (or Erythropygia galactotes, depending upon your source). Never heard of it? Well, you won’t find it in a field guide of southern African birds. The bird was well off course, over 5,000 km from its normal range in southern Europe, the Middle East, and northern Africa north of the Sahara. 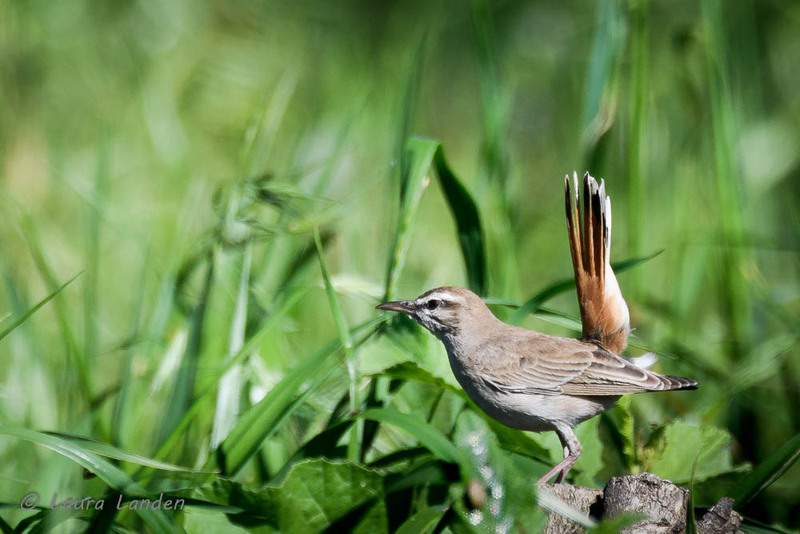 Its common name (again, depending on your source) is Rufous-tailed Scrub Robin. Several versions of the common name are around–some just call it a Robin, others hyphenate Scrub-robin, etc. I’ll be following the conventions in Birds of Southern Africa, fourth edition, by Ian Sinclair, Phil Hockey, Warwick Tarboton, and Peter Ryan. We chanced upon a group of Twitchers, the nick-name for people who rush to see any bird rarity, close to home or not, mostly not. A Rufous-tailed Scrub Robin in South Africa is a mega-twitch, for sure. It was seen earlier, but was down in the grass when we arrived. We watched a while, looked at other birds, then came back, just as the bird popped up into view and perched on a log. Here’s my most-fortunate photo of this most-unfortunately lost bird. North American birders traveling to South Africa are confronted with many more species than are found on their home continent. My Southern Africa field guide lists more than 950 species, including pelagics, or oceanic birds. In our two weeks we saw nearly 225 species, a lot, but a mere drop in the bucket of possibilities. Several families of birds are found in South Africa that do not exist in North America. There are Scrub Robins and Robin-chats, Buzzards and Bustards, Wagtails and White-eyes, Bulbuls, Boubous, and Brubrus. Waxbills and Weavers, Hoopoes and Hornbills, and the strangely-coiffed Hamerkop, which you’ll see later on. What a wonderful post. I’m so happy you made it to this safari. And the picture is beautiful. And to see birds not found in North America–terrific!